Bingo needs some colorful numbered balls and a game card. The balls with numbers on will be randomly selected by a virtual caller or generator. The numbers will be displayed on the computer screen. The players than have to match the numbers on the balls, to those on their bingo card/or ticket in a certain pattern. Most common are the American 75 ball bingo and the European 75 ball bingo. The 75 ball bingo game card is provided with five vertical and five horizontal columns, forming a grid of 25 squares. The letters of the word B – I – N – G – O refers to each vertical column: B” used for numbers 1 – 15, I for 16 – 30, N for 31 – 45, G for 46 – 60, O for 61 – 75. The square in the center never contains a number and is a free space which the players are allowed to mark if part of a pattern used in the game. The purpose of the game is to build pre-determined patterns on a grid. The player marks the numbers on the balls randomly selected by the games number generator (or virtual caller), to those on their bingo card in a certain pattern. There are various patterns possible – X-pattern, 4-corners, Coverall, etc. – related to the specific theme of the game or promotions. Most popular is the “Coverall” pattern/game where all numbered squares except the free spaces have to be covered. The first player who can complete the needed patterns, will be the winner. Most popular however, specific online, is 90 ball bingo. The way to play is almost the same as 75 ball bingo with little differences. The game card is made of three horizontal and nine vertical columns, forming a grid of 27 squares. The grid is marked with 15 different random numbers, five in each row. The rest are empty spaces. The meaning of the game is minimum to mark off one row of numbers. How more rows completed how higher the winnings. Full House, meaning all rows and numbers marked off, is usually the jackpot prize! Mostly the terms/requirements to win are simple but if the game is part of a progressive jackpot it could be a little more difficult to make a win. 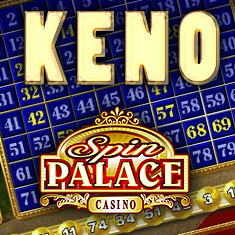 Keno is not very different from bingo. An automatic (virtual) generator will choose at random 20 different numbers from 1 through 80. The player has to guess which numbers will come out. He can choose no more than 15 different numbers and then make a bet for each round of the game. The meaning of the game is to have as many numbers correctly as possible. The amount of the price depends on the number of players whose numbers match with the randomly generated numbers. At free fair play casinos you can play mobile and all other platform devices Nodeposit free sign up casinos. The same no deposit coupon bonuses provided by an online casino as for example 50/100/200/255 cash sign up bonus are waiting to be won. Find all the Exclusive Casino No Deposit Bonus Offers in the Best Free Online Casinos. Mostly these are fast and instant payout casinos offering a Cazino voucher. At such Nodeposit casinos or Kazino, you can receive bonuses, FREEROLL, 3D slot games, free exclusive Tournaments in the kazino with guaranteed, Secure, fast and instant payout. Luck and fortune quest Casinos to trust, take the money winnings at no deposit casino's.